While I was walking, I found this tree with amazing blue and white flowers and am really curious to know its name. It also has long strap-like leaves. This is Strelitzia nicolai, commonly known as the Giant Bird of Paradise. It is a tropical plant, native to Africa, but can be grown in USDA zone 13 with protection from the cold. It is a relative of the hardier and therefore more widely grown S. reginae (the Bird of Paradise flower), which has similar shaped flowers but in shades of orange blue and white. a dark blue bract, white sepals and a bluish-purple "tongue". 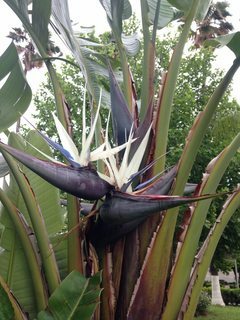 It can grow to 30 feet tall, and has gray-green foliage similar to banana plants. Not the answer you're looking for? Browse other questions tagged identification trees tropical or ask your own question. What is this small plant with tiny white flowers and tiny saw-teethed leaves? What is this plant? What is the white stuff on it? What is this bulb with pink single flowers and glossy strap-like leaves? What is this plant with leaves over a foot long, in Pennsylvania?